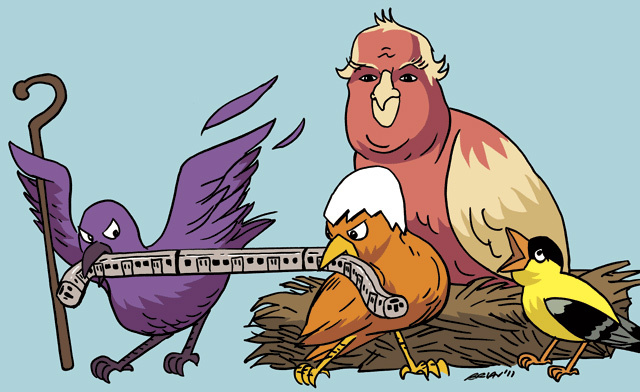 Mama bird (aka Rob Ford) looks on as her children fight for a share of the subway—there isn’t enough for everyone, you know. Illustration by Brian McLachlan/Torontoist. When you talk to riders of the 36 Finch West bus, you hear the same stories about delays, overcrowding, and unreliable service. The word “frustration” comes up in practically every conversation. Bus drivers talk of the stress associated with daily interactions with unsatisfied patrons. It’s a given that most people would prefer a subway along this route. Unfortunately, no one is seriously proposing one. In fact, almost nothing is being said about Finch Avenue West—a route that spans seventeen kilometers and serves around forty-three thousand riders on an average weekday—even as city councillors reassess transit priorities under Mayor Rob Ford’s new administration. Ford has been criticized for announcing the end of Transit City, a plan envisioned by former mayor David Miller and former TTC chair Adam Giambrone, and fleshed out by TTC staff and Metrolinx, the provincial transit planning authority. That plan includes a proposed Finch West Light Rail Transit (LRT) line to replace the 36 Finch bus. However, Ford cannot be blamed for last year’s provincial funding decisions that delayed LRT construction along Finch by several years. In addition, while Ford is guiding the TTC towards new priorities, and talking mainly about Sheppard Avenue East and Eglinton Avenue developments, city council as a whole will almost certainly have to vote on any new transit measures. Councillor James Pasternak (Ward 10, York Centre), whose ward includes a portion of the troublesome stretch of Finch, spoke with us following a meet-and-greet he hosted for constituents recently. Pasternak believes that “Finch West is not on the radar screen” at City Hall, but said little to indicate that he himself considers improving the route a priority. He spoke at length about his opposition to an LRT on Finch, saying repeatedly that the plan would “remove [traffic] lanes from system roadways.” Pasternak seemed genuinely surprised when we insisted that the environmental assesment for the Finch LRT [PDF] contains no lane reductions, as the roadway would be widened to accommodate the rail line while preserving the existing number of traffic lanes. Councillor Anthony Perruzza (Ward 8, York West), whose ward would be served by phase one of the proposed Finch LRT, spoke with us by telephone. He expressed concern that Finch West “is not working for transit users, cars, trucks, and certainly not for pedestrians and bikes.” Perruzza has been extremely supportive of the proposed rail plan, but says he has been unable to speak to the mayor’s office about it. Indeed, the city’s official plan suggests opportunities for residential development along Finch Avenue near Bathurst, as well as near the intersections at Jane and Keele streets respectively. The entire Finch West bus route is designated as a “priority segment” among surface routes in the city [PDF]. Hannah Bontogon, a community outreach worker who has been commuting to her workplace via the 36 Finch bus for three years, highlights the fact that Finch West includes the priority neighbourhoods of Jamestown, Jane-Finch, and Westminster-Branson, identified because of their relatively poor access to local programs and services [PDF]. She says improvements to transit would “increase access to places where residents receive programs and services,” and improve their employment prospects. While the TTC has not specifically explored BRT options in the hydro corridor, the Finch LRT study states that staff prefer light rail to buses “due to (the) more appropriate passenger-carrying capacity” of the light rail vehicles. An LRV can carry 280 passengers, more than four times the capacity of a TTC bus. Munro also stated his view that rapid bus service in the hydro corridor is not a comprehensive plan for Finch West because the hydro corridor diverts west of highway 400. “You’d either have to end the bus at the 400, which offers nothing for riders at Humber College and Rexdale, or you’d have to put the bus back into traffic west of the highway,” said Munro.